The UNH STEM Discovery Lab in Manchester will host its second annual 4-H Science Bonanza, providing a variety of free family activities for youth ages 5 to 13 on Saturday, Dec. 8. 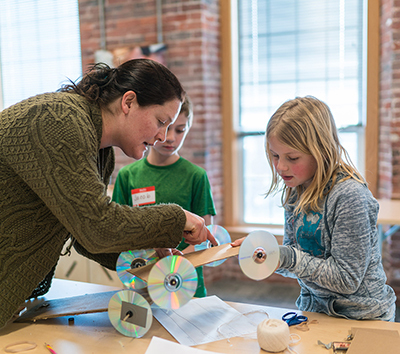 Families will be able to find the electricity hidden inside lemons, build a solar oven, race rubber band-powered cars and discover the buzz around pollinators among other activities from 9 a.m. to 3:30 p.m. at the UNH STEM Discovery Lab, 88 Commercial St., Manchester. Participating youth will explore STEM topics in a fun, interactive atmosphere. Co-hosted by New Hampshire 4-H, the Science Bonanza offers three 80-minute workshops across three topic areas: Makers/engineering, plant and animal science and ecology/environment. Educators from 4-H, UNH Cooperative Extensions and volunteer instructors will lead hands-on workshops on using 3-D design tools such as TinkerCad, how to care for poultry, cooking with solar ovens and much more. What can you and your family expect at the Science Bonanza? Youth interested in imagining, designing, building and coding will love the maker/engineering workshops, which include a bridge-building challenge for youth ages 5-7, an introduction to computer programing and a session on making a solar-powered oven (and using it to cook s’mores). For youth eager to learn about plant and animal science, there are sessions on assembling a hydroponics system, raising chickens and investigating how pollinators affect agriculture and the environment. Sessions on finding the “hidden” electricity in fruits and vegetables and using creative thinking to solve problems are perfect for youth fascinated by health and wellness. The ecology/environment topic area includes sessions on the water cycle and an up-close look at squids, whales and other marine life. Registration information is available at extension.unh.edu/events/4-h-science-bonanza.